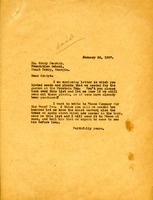 Martha writes to Mr. Young asking if he would send another catalog or price list that he mentioned in a previous letter, and inquires about if possible he could supply flowers. 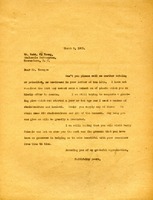 Mr. Young writes to Miss Berry telling her he does not carry the type of plant she wishes to purchase. 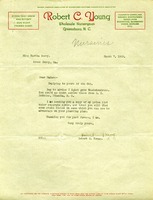 He does give her the name of another company that is likely to carry the plant. This is a key to the planting plan for Mountain Cottage. It has a list of all the plants names and the quantity of them.